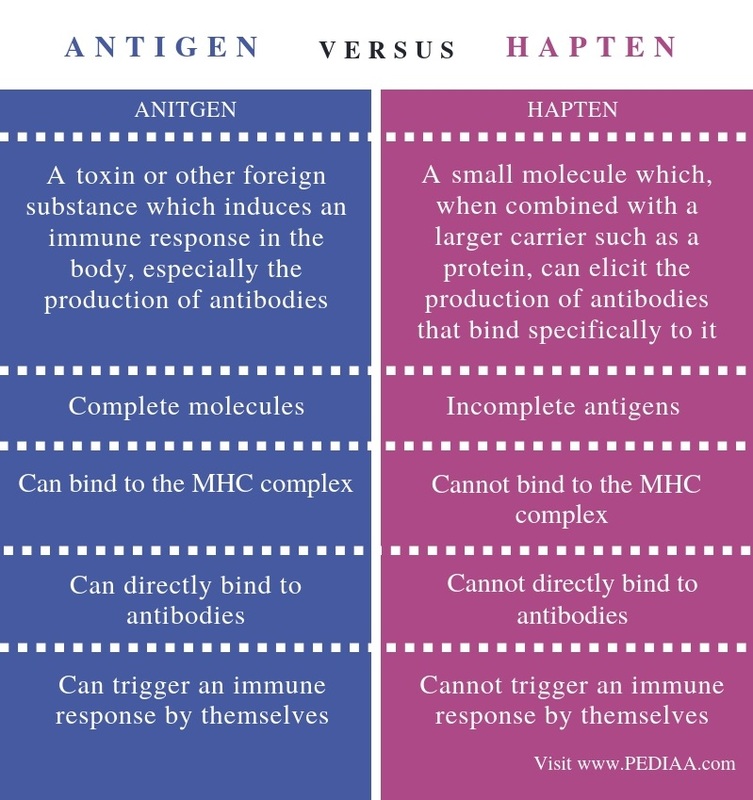 The main difference between an antigen and a hapten is that an antigen is a complete molecule that can trigger an immune response by itself whereas a hapten is an incomplete molecule that cannot trigger an immune response by itself. Antigen and hapten are two types of immunogens that can trigger immune responses. Furthermore, Antigens can bind to the MHC complex while hapten cannot bind to the MHC complex and, cannot be presented to the T cells. Exogenous antigens – Epitopes on the surface of the pathogens found in the extracellular space serve as exogenous antigens. Endogenous antigens – Epitopes generated inside the cell as a result of the cell metabolism are endogenous antigens. The epitopes generated as a result of the regular metabolism are self-antigens while the molecular components of the pathogens inside cells are non-self antigens. Autoantigens – These are the endogenous antigens mistakenly recognized as non-self antigens by the immune system. This results in the destruction of self-tissues, causing autoimmune diseases. Neoantigens – These are the molecules expressed on the surface of the cells infected by oncogenic viruses. A hapten is an incomplete antigen which can elicit an immune response only when attached to a large carrier such as a protein. 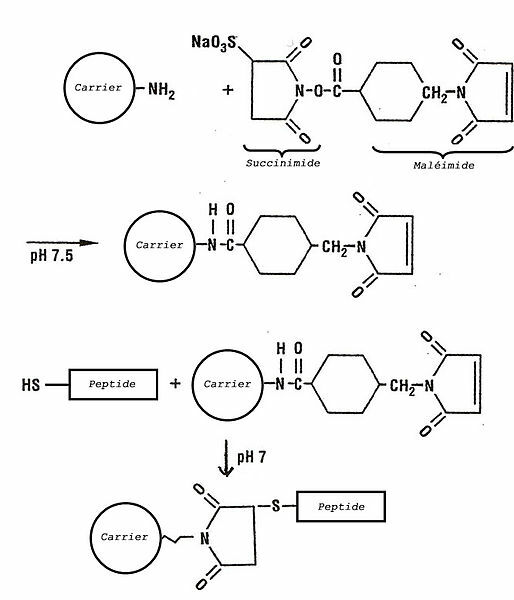 Hapten carriers are circulating molecules through the body. An adduct refers to the combination of the hapten and the carrier. However, haptens cannot bind to the MHC complex independently; hence, they cannot be presented to the T cells. Urushiol is a well-known hapten found in Ivy. It serves as a toxin, which causes cell-mediated contact dermatitis. When absorbed, it is oxidized into quinone inside the skin cells. Quinone reacts with skin proteins to form an adduct. The hapten-carrier adduct serves as a complete antigen, which can trigger an immune response. Our body produces antibodies in response to the hapten-carrier adduct. However, hapten can inhibit the binding of the antibody to the hapten-carrier adduct in a process known as hapten inhibition, inhibiting the antibody response. Antigen and hapten are two molecules, which can trigger immune responses by acting as antigenic agents. Moreover, they can serve as immunogens. Also, both antigens and haptens can bind to antibodies. An antigen refers to a toxin or other foreign substance which induces an immune response in the body, especially the production of antibodies, while a hapten refers to a small molecule which, when combined with a larger carrier such as a protein, can elicit the production of antibodies that bind specifically to it (in the free or combined state). These two definitions explain the basic difference between an antigen and a hapten. Antigens are complete molecules while haptens are incomplete antigens. Hence, this is a major difference between an antigen and a hapten. Furthemore, the ability to bind to MHC complex contributes to a difference between an antigen and a hapten. That is; antigens can bind to the MHC complex while haptens cannot bind to the MHC complex. 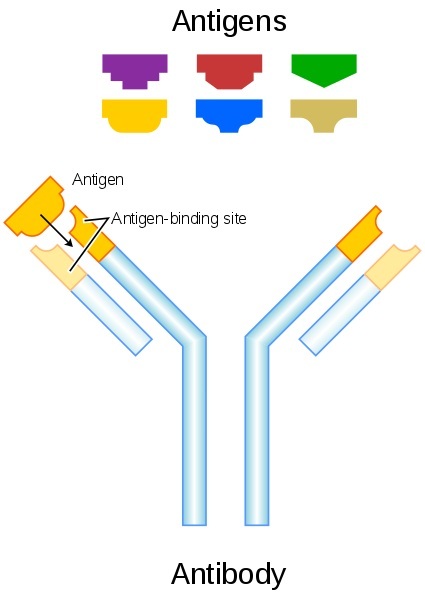 Another difference between an antigen and a hapten is that antigens can directly bind to antibodies while haptens cannot directly bind to the antibodies. In addition, an important difference between an antigen and a hapten is that antigens can trigger an immune response by themselves while haptens cannot trigger an immune response by themselves. In brief, antigens are molecules that can elicit an immune response by themselves whereas haptens need to bind to a carrier molecule to become a complete antigen, which elicits the immune response. Both antigen and hapten-carrier adduct serve as immunogens. Thus, the main difference between an antigen and a hapten is the ability to elicit an immune response independently.